Order Pandemic: Fall of Rome online through our website today! 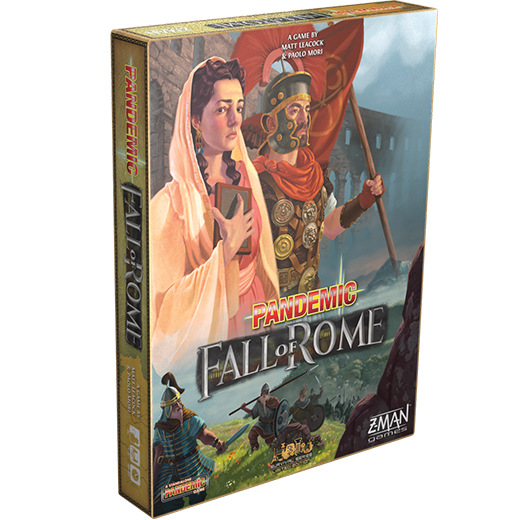 Earlier this month we announced the new title joining the Pandemic family: Fall of Rome. You can read the full announcement article here. 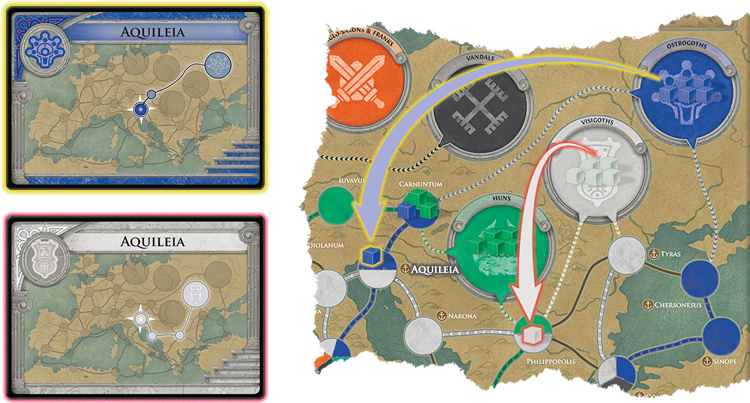 Pandemic: Fall of Rome is the third title in the Survival series, following Iberia and Rising Tide. 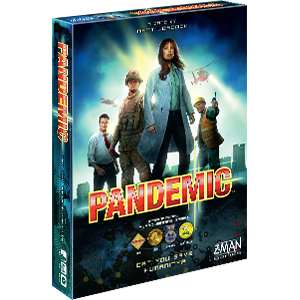 For those of you unfamiliar with Pandemic Survival, it's the world's first tournament format for a cooperative game that debuted back at Essen SPIEL 2015 and has been going strong ever since. Games in the Survival series celebrate the people, culture, and heritage of the host country where the World Championship is held. This year the world championship is being held in Lucca, Italy, at the famous Lucca Comics & Games event in early November. For each Survival game, Matt Leacock partners with a native designer from the host country. This year, Matt Leacock joined forces with Paolo Mori to create a game inspired Italy's rich history. The Roman Empire spread across the globe for many years, but various factors challenged its survival: economic downturn, political struggle, and invading forces eventually led to its demise. In Fall of Rome you must protect the Empire from these invading forces. Over centuries the Roman Empire expanded far and wide, creating a massive geographical footprint. Many of the neighboring people began to push against the Roman borders, and in Fall of Rome the many invaders have been distilled into five general groups: Anglo-Saxons & Franks, Vandals, Huns, Visigoths, and Ostrogoths. Determined to fight back against the Empire, the tribes gathered their forces to march toward Rome. Now you must rally the Roman legions and work with your fellow citizens to stop the invading hordes from spreading to the capital and sacking the city. At the end of each player’s turn, cards from the barbarian deck are drawn. The card will illustrate which tribe is marching toward which city. However, unlike regular Pandemic, a cube is not just automatically placed in the city on the card. Paolo and Matt put their heads together to develop a clever new movement system that imitates the real paths a tribe would have undertaken. Since, realistically, troops traveling across the Empire couldn't just pop into a distant city, this new mechanic models how they were forced to steadily march across the land to reach their destination. 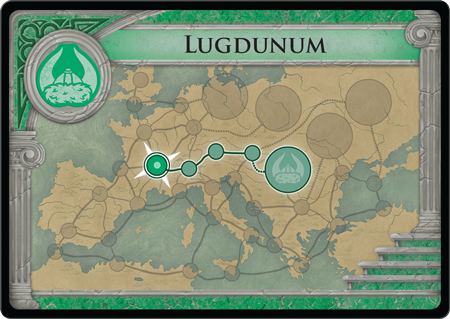 This barbarian card shows that it is the Huns (green) advancing and they are moving toward Lugdunum. When flipping a barbarian card, you will need to identify which tribe is moving and then check the pictured city. Depending on the status of the pictured city, the barbarians could invade in different ways. Let's look at a couple situations of what would happen if the Hun Lugdunum card is drawn and how the barbarian movement is resolved for each scenario. When checking Lugdunum, you see there are already two cubes in the city. Since the tribe already has a presence there, another cube is added. Here the Huns are not present in Lugdunum, but are present in Mediolanum, the previous city to Lugdunum on the Hun's migration path. As a result, the Huns advance to Lugdunum. The Huns are not present in the drawn city or the previous city, so we trace backwards on the path until we find a city that the barbarians can march into. In this case, the Huns keep marching forward along their path and invade Mediolanum. Here the Huns have yet to begin their march toward Rome. Even though Lugdunum was drawn, they haven't advanced that far, so instead they just start their path by invading Carnuntum. With pressure coming from all corners of the Empire, the many tribes advanced toward Rome through different paths, but often passed through the same cities. A single city can be invaded by multiple tribes, such as Aquileia, which is threatened by both the Ostrogoths and the Visigoths. The same rules apply for the migration path of each tribe. The tribes will continue their steady march toward the capital, but you can prepare your defenses against the oncoming horde by mobilizing the Roman legion. If a legion is in the city where a cube would be placed, the legion denies the barbarian advance. While Rome's early ambition was one of conquest, at this point the Empire seeks peaceful coexistence by drawing up treaties with their neighbors. 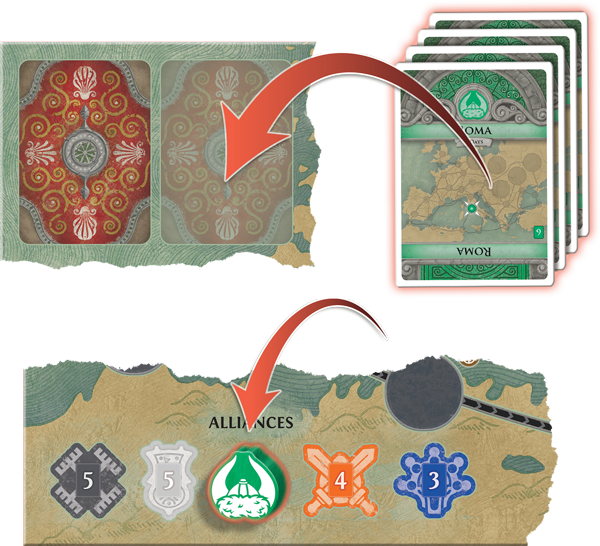 In order to restore the peace, you must forge alliances with each tribe, and if you manage to forge alliances with all five tribes, you win the game. In order to forge an alliance, each tribe has its own requirement. The Ostrogoths are more amicable to a treaty, so they require only three cards, while the Vandals are more resistant to Rome's requests for peace and require five cards. Requiring four cards, the Huns will take a little more convincing than the Ostrogoths but are more amenable to an alliance than the stubborn Vandals. Will you be able to stop the destruction of the Roman Empire? Pre-order Pandemic: Fall of Rome and prepare your defenses. And stay tuned for more gameplay coverage with future articles discussing the roles and battle mechanics!